Reality Check: How long can nations go without governments? The 2010 general election produced the UK's first hung Parliament since 1974 and resulted in the first peacetime coalition since the 1930s. But the coalition negotiations took only five days, which was exceptionally quick compared with most democracies, where they can take weeks or even months. 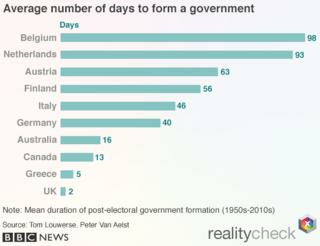 The record for the longest period without an elected government in a democracy is held by Belgium, which went 541 days without a government in 2010-11. While the two main political parties fought over policy issues, the country was run by a temporary government led by a former prime minister. The temporary government did not make any big decisions on foreign policy or defence, nor on the budget or the national debt, leading to fears that Belgium could default on its sovereign debt at the height of the eurozone crisis. This did not happen, and on 6 December 2011 a new coalition government was sworn in. Belgium broke the previous record held by Iraq, which took 290 days in 2010 to agree a government, following the first post-Saddam Hussein elections. Germany took 86 days in 2013 to reach the current coalition agreement, and in the same year Italy took 62 days to form a government. The Netherlands took 49 days following the elections in 2012, which is a relatively quick turnaround for a country that, in 1977, spent more than 200 days in post-election negotiations. In most democracies, single-party majority governments are rare because of the electoral systems used. New Zealand has had seven hung parliaments since introducing proportional representation 20 years ago. Most European countries have coalition governments. Even in Canada, which uses the same first-past-the-post system as Westminster, there were 10 minority governments in the 20th Century and three since 2000. Polls suggest that the 7 May 2015 vote in the UK will produce another hung Parliament. If it does, the negotiations may last a lot longer than five days this time, because the recent experience of coalition is likely to lead to a more detailed agreement on how new arrangements could work. The rules say that the incumbent prime minister and government remain in power during the coalition negotiations, but no big decisions on policies, contracts or public appointments can be taken. If there are any big international decisions to be taken during the period with no government, the incumbent government is expected to consult opposition parties. In 2010, Alistair Darling, the outgoing Labour Chancellor of the Exchequer, attended a European finance ministers' meeting on 9 May, while the coalition negotiations were still taking place. The meeting was held at the height of the eurozone crisis, as Greece found itself on the brink of bankruptcy, threatening the very existence of the single currency. The ministers agreed the first bailout for Greece, using, in small part, an EU-wide fund, as well as much more substantial eurozone-only funding. Alistair Darling consulted his Conservative and Liberal Democrat counterparts ahead of the meeting. This time around, there is a big EU summit planned for 21-22 May in Riga, where the EU leaders will meet with Ukraine and other East European countries, to discuss closer cooperation. Last time the EU leaders held such a summit was in November 2013, when the Ukrainian president decided not to sign a partnership agreement with the EU, triggering mass protests that eventually led to the current conflict in eastern Ukraine. On 7-8 June, the G7 countries (Canada, France, Germany, Italy, Japan, the UK and the US) are holding a summit in Germany. Will there be a new government in place by then? Other countries have managed perfectly well for that long without one. What is the truth behind the politicians' claims on the campaign trail? Our experts investigate the facts, and wider stories, behind the soundbites.